Property Location A stay at Washington Plaza places you in the heart of Washington, minutes from Franklin Square and close to White House. 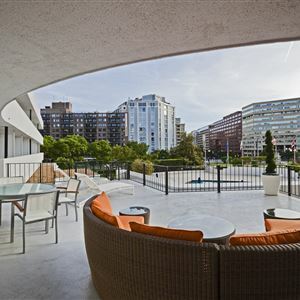 This hotel is close to Ford's Theater and Washington Monument. Rooms Make yourself at home in one of the 340 air-conditioned rooms featuring refrigerators and MP3 docking stations. Your pillowtop bed comes with Frette Italian sheets. Wired and wireless Internet access is complimentary, while 32-inch flat-screen televisions with cable programming provide entertainment. Private bathrooms with shower/tub combinations feature rainfall showerheads and complimentary toiletries. Amenities Be sure to enjoy recreational amenities including an outdoor pool and a 24-hour fitness center. This hotel also features complimentary wireless Internet access and concierge services. Dining Grab a bite to eat at the hotel's restaurant, where you can take in a pool view, or stay in and take advantage of room service (during limited hours). Relax with your favorite drink at a bar/lounge or a poolside bar. Buffet breakfasts are available daily from 6:30 AM to 11 AM for a fee. Business, Other Amenities Featured amenities include complimentary wired Internet access, a 24-hour business center, and complimentary newspapers in the lobby. Planning an event in Washington? This hotel has facilities measuring 12000 square feet (1115 square meters), including meeting rooms. Self parking (subject to charges) is available onsite. 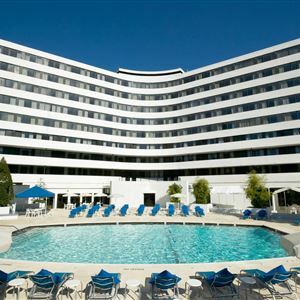 A stay at Washington Plaza places you in the heart of Washington, minutes from Franklin Square and close to White House. This hotel is close to Ford's Theater and Washington Monument. Make yourself at home in one of the 340 air-conditioned rooms featuring refrigerators and MP3 docking stations. Your pillowtop bed comes with Frette Italian sheets. Wired and wireless Internet access is complimentary, while 32-inch flat-screen televisions with cable programming provide entertainment. Private bathrooms with shower/tub combinations feature rainfall showerheads and complimentary toiletries. Grab a bite to eat at the hotel's restaurant, where you can take in a pool view, or stay in and take advantage of room service (during limited hours). Relax with your favorite drink at a bar/lounge or a poolside bar. Buffet breakfasts are available daily from 6:30 AM to 11 AM for a fee. Featured amenities include complimentary wired Internet access, a 24-hour business center, and complimentary newspapers in the lobby. Planning an event in Washington? This hotel has facilities measuring 12000 square feet (1115 square meters), including meeting rooms. Self parking (subject to charges) is available onsite.